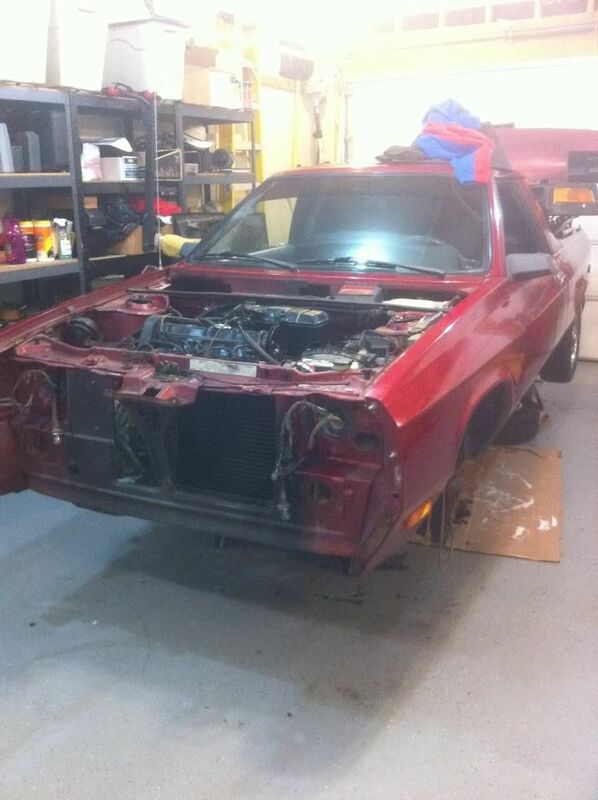 I'm in the very early stages of an LSR build with an '84 Dodge Rampage. Seldom Seen Slim suggested that I should start a build thread, and I agree that it's a good idea to start one. Even though I'm still in the "tear apart" stages, I thought I'd start posting photos, and hopefully will get into the good habit of keeping up with the photos and information. Anyway, as with most car projects, this one starts with an interesting story. I've always had a soft spot in my heart (head) for the '80's Dodge FWD vehicles. 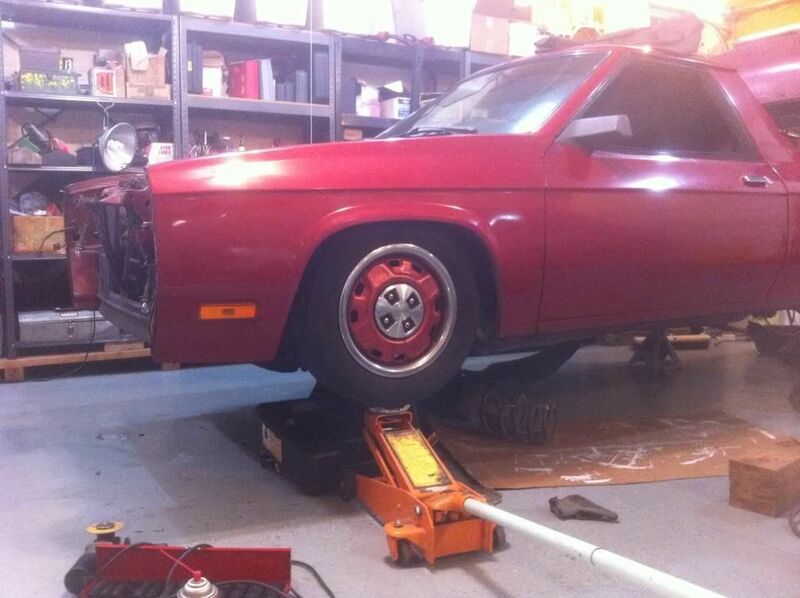 One of my first cars was an '80 Dodge 024, which was equipped with a VW 1.7L gas engine. 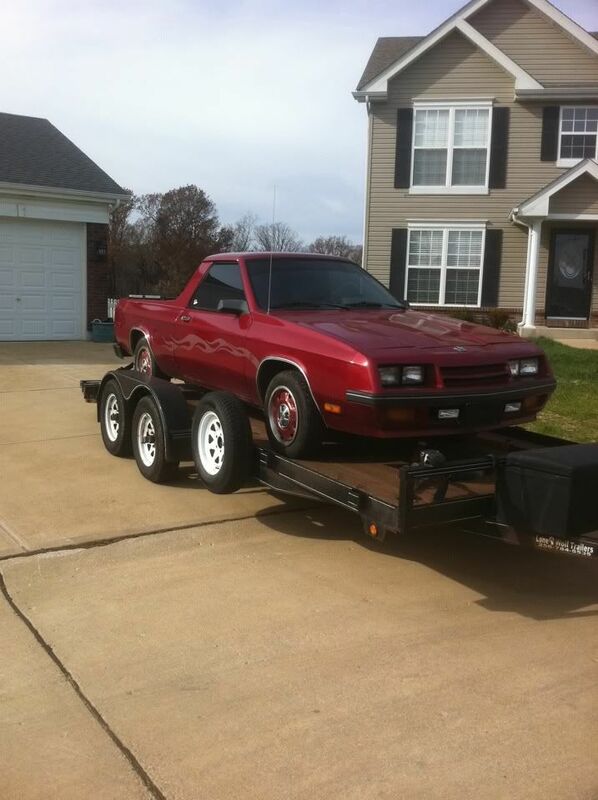 This was the predecessor to the 2.2L Dodge 4-banger that came out in '82 or so. So, as I'm coming home from a bicycle race on a recent Sunday afternoon, I see this Rampage sitting on the shoulder of the highway, within 3-4 miles from my home. I think to myself - "hmm, you don't see one of those everyday". Then the next morning, it's still parked there on the side of the highway. I didn't have time to stop then, but I decided that I would come back at lunchtime and leave a note if it was still there. So I went back at lunchtime, lo and behold, it's still there - no license plates on it, but no visible damage. I figure, "what the heck", maybe the door's unlocked. Sure enough, the door is unlocked and the key is in the ignition. So I laid my note on the seat with my phone #, and tried the key. Nothing, not even a click, but the radio display lit up. I shut the door, step back to take a few photos, and a Missouri State Trooper pulls up, lights flashing.... He asks if everything is OK, and I tell him what I'm doing, as I ask how long they will let it sit before towing it away. He tells me at least 48 hours, to allow the owner to retrieve it. I hope back in my car and head back to work. On my way home, the Rampage is gone, and I figure that I may never see it again. However, the next morning, a guy calls me, saying that he got my note. I ask him about the Rampage, and he says he had just bought it, and was on his way home when the engine let go. He said that another engine came with the Rampage, but that he didn't feel up to putting it in. I made him an offer for the Rampage and all the extra parts - he accepted, and I showed up at his home about 75 miles away (he had the broke-down Rampage towed to his house from the side of the highway). Here is the first of my photos, with the Rampage on a friend's trailer, about to be unloaded at its new home (my house). Ooops, I forgot to upload the pics to photobucket - will post soon. Steve, what are the details of the planned build? OK, let's see if I can successfully post photos. This is what she looked like when I brought her home. Pretty much stock, with the exception of some tacky looking flames and a pretty decent tint job. The outer sheet metal looks good, with almost no rust. However, these things are known for rust in the front footwells. They tend to get leaks at the bottom of the windshield frames, which keeps the carpets wet. Back in '86, my '80 was already rusted through in the floorboards. 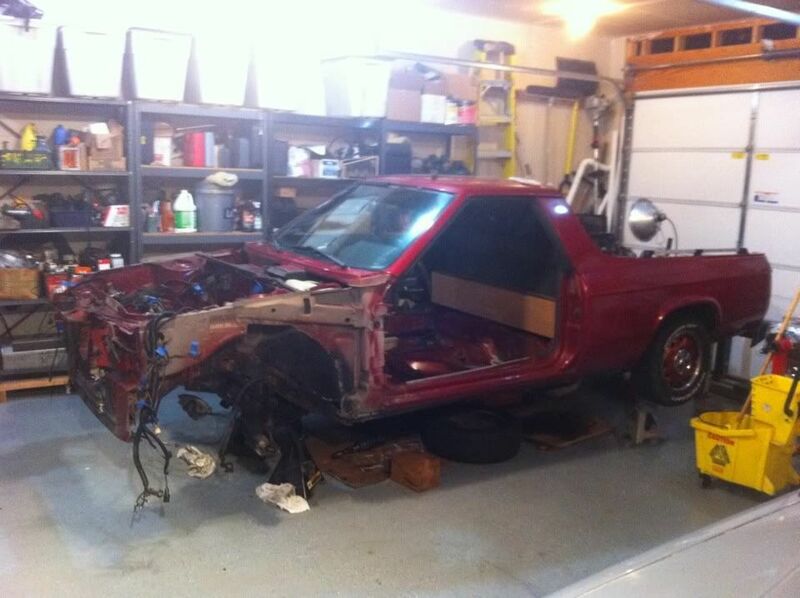 This one is going to get "subframe" connectors and a full cage, so the rust in the floors won't be too much of a concern. It's all going to be fabbed in. After I got it in the garage and started pulling it apart, I couldn't resist the urge to see how low I'll be able to get the front suspension. There is a pretty good wealth of knowledge about these cars/trucks. It's the same platform as an Omni/Horizon/O24/TC3/Turismo/Charger/Scamp. The "hot" setup for the front suspension is a swap from a later model Neon. There are a lot of coil-over and air suspension options for the Neon suspension. Anyway, this is what I'm aiming for in terms of ride height for the front end. Let's see if I posted the photos right before getting any deeper. My plan is to run this in one or more of the Diesel Truck categories. The VW Rabbit pickups have done well in these classes, and I'm hoping there is some room for improvement with this chassis over the Rabbit pickup. Obviously, Mike Manghelli has been quite successful with his front-wheel-drive Rabbit P/U, with both diesel and gasoline fired engines. Since this chassis was originally offered with a Volkswagen gasser drivetrain, most of the common VW diesel engines are a more-or-less direct bolt-in, using all factory motor mounts and brackets. There is also potential with some of the 4 and 6 cylinder Chrysler powerplants (gasoline), but what I'm aiming to do will be in the diesel world. My mind is constantly racing with the details of the build (suspension, engine, chassis, cooling, weight distribution, tire sizes, transmission ratios, etc). I'm a Metallurgical Engineer in my day job. I don't say that to try to impress anyone, just to give a little background in terms of the way I will think about this project. I'm currently working on a Body rotisserie, which should be done in another couple of weeks. The rotisserie should make a lot of the chassis fabrication work much easier than laying on my back while welding overhead. Here are a couple of very basic pics of the beginnings of the rotisserie. Just some of the very rough-cut pieces to make the ends of the rotisserie. Here are the basics of the end pieces of the rotisserie. Over the weekend, I managed to cut a lot of square tubing and drill a lot of holes for the adjustable portions of the rotisserie. More pics to follow. A few more pics for now - all taken from my camera phone. I'll have some better pics loaded later, taken with more of a "real" camera, but these are not bad considering they came from my phone. Just in case anyone was wondering what an '84 Rampage looks like with the nose and hood removed. I've started labeling the wiring harness so that I'll know what's what at a later date. Here it is, stripped down a little further. The engine, trans, and most of the front suspension have been removed, along with the fenders and doors (those doors are a PITA to remove, the hinges are welded on, instead of being bolted). The hinges contain 1/4" roll pins which have to be driven out to remove the doors, and there is almost no room to get a punch and hammer in there. Anyway, they are out now. Next, the wiring harness, glass, and rear suspension will get pulled off. Then it will be ready to put onto the rotisserie (when the rotisserie is done). Before mounting the shell on the rotisserie, I will weld in some X shaped supports in the door frames from thin-walled square tubing, to keep the body from racking or distorting while on the rotisserie. I'd like to be able to open and close the doors after I put it back together. There is rust in both sides of the front floorpans and formed "frame rails" in the footwells. My plan is to cut away the bad parts of the sheet-metal formed frame rails, and will weld in rectangular tubing, probably 1-1/2" x 3" x 1/8" wall. The rectangular tubing will then extend rearward to the point where the front of the rear springs attach, with some "ladder" like supports along the way, making a basic ladder frame from the point where the front K-member attaches, back to the front of the rear springs (leaf springs in the rear). On the outside of this ladder frame, will be additional sections of rectangular tubing (again 1-1/2"x 3" x 1/8 wall) that will tie into the rocker channels. I'll call these "frame horns" for now, even though that description isn't entirely perfect. My plan is for the roll cage to tie into these frame horns both at the front and rear of the passenger compartment. In addition, I will have tubes extending from the front of the cage, through the firewall, and tying into the front strut supports. I'll have to finish up most of the cage before welding in these frame horns, so that I can have room to move the cage around for welding on the top side. After the cage is done and the frame horns welded in place, the cage can be welded to the frame horns, and the cut-out portions of the floor can be covered. Jeg's makes a Chrysler roll cage in 10 and 12 point varieties, but I think I will be better off buying a tubing bender and making my own. I have read thet the Jegster cages are not a perfect fit to the interior of the chassis they are intended for, often giving up space that could be better utilized with a custom cage. 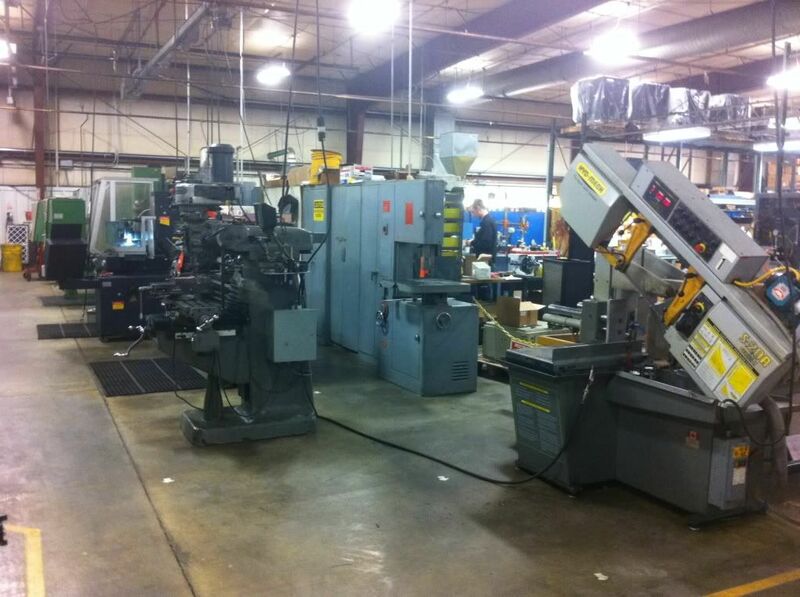 My day job includes managing a machine shop complete with all of the tools of the trade, Bridgeport, manual lathes, CNC milling equipment, CNC lathe, cut-off saws, bead-blasting, welding equipment, etc. Lack of tools will not hold me back. Lack of knowledge and expertise will be a bigger hurdle, but I fully intend to do all of the work myself. I'm sure there will be some things that I won't be able to do, but I haven't been able to see far enough ahead to figure out what they might be. 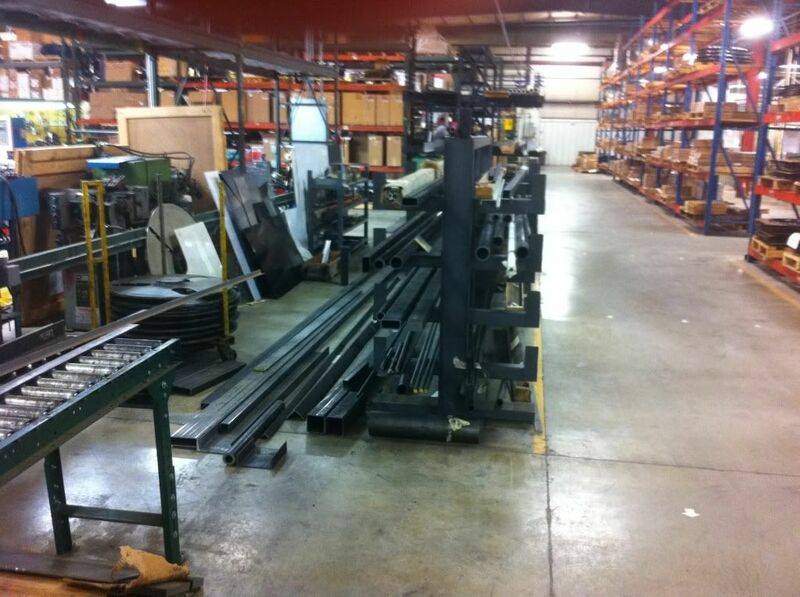 We deal a lot with a local powder coater for some of the equipment we manufacture. I plan to have a lot of the underbody parts done in black powdercoat, in the hopes that it can help repel some of the salt effects. The old saying of "Don't give up your day job." has a whole new meaning here. If the machinery's there, there's probably some helpful knowledge too! There is a good supply of knowledge here also. The M/C shop leadperson / supervisor campaigns a 410 inch sprint car and one of those 650 cc mini-sprint cars. He's a big time gear-head. 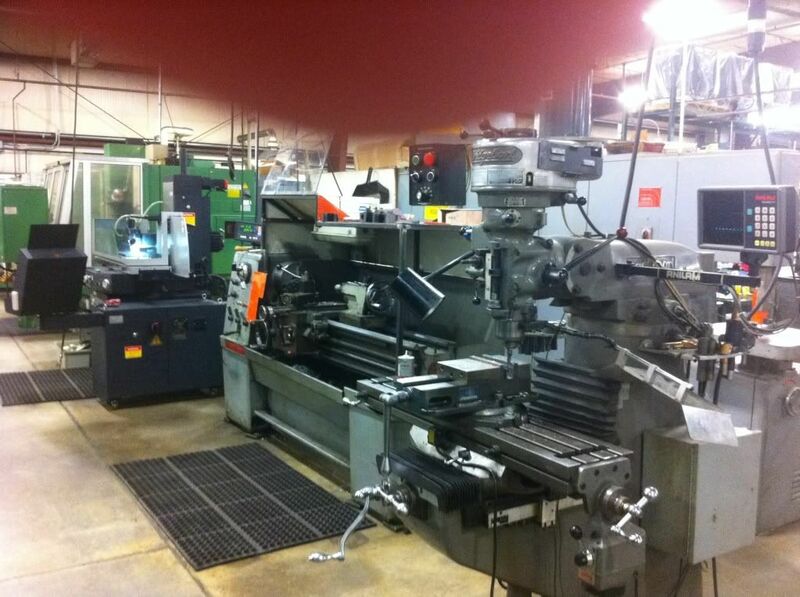 I can tap into the machinist's knowledge base, but I still want to do all the hands-on work myself. Like I said - lack of equipment and materials will not hold me back. The lack of ability to keep my thumb away from the phone's camera might be a problem, though. Steve, not second guessing... but why not just build a tube frame for the truck, your roll structure should probably be mounted to the frame and not a piece that sticks out of your frame. Or maybe I don't understand your horns. Keep us posted, looks like you have a good start. When I get the body rotisserized, I'll try to show a little better how I think the frame will work. The "horns" will be short sections (maybe 6" long or so) that will help to tie the unibody rocker panel rails to the rectangular tube ladder frame. I don't have a good way to post drawings at this point in time - hopefully I'll be able to figure out how to do so. At least in my mind, the horns will be an integral part of the fabricated frame and the unibody of the truck, tying the two together. I envision some cross-shaped support gussets that will tie the main frame rails into the supports that will tie the frame rails together, as well as tying the short horns to the main rails. The outer ends of the horns will tie into the rocker channels, probably with some 1/8" support plates. 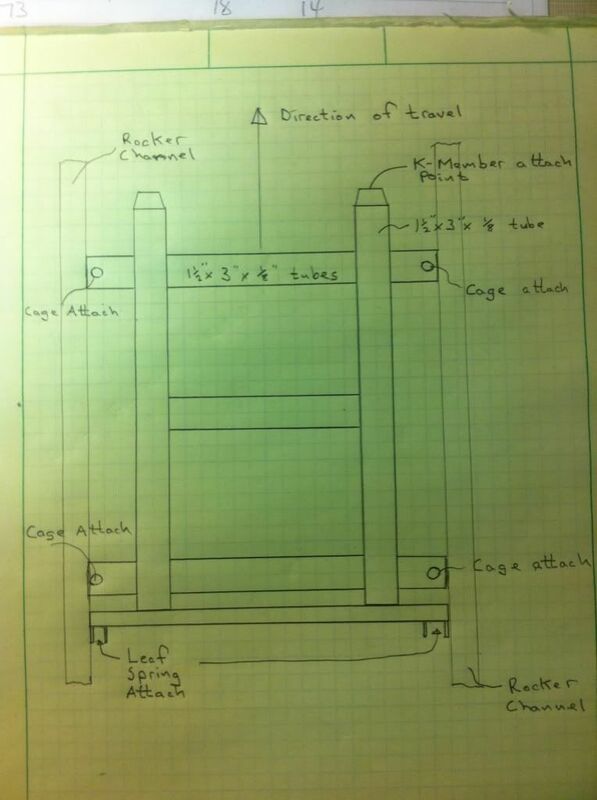 I think that this design will help to tie the entire cage and unibody together, but I'm definitely open for suggestions. I'll definitely post photos and mock-ups before doing any serious welding. I'm afraid that construction of a complete tube chassis is beyond my abilities. Here's a crude sketch of what I'm thinking about the frame / subframe connectors, and how the rails would be tied into the unibody structure. 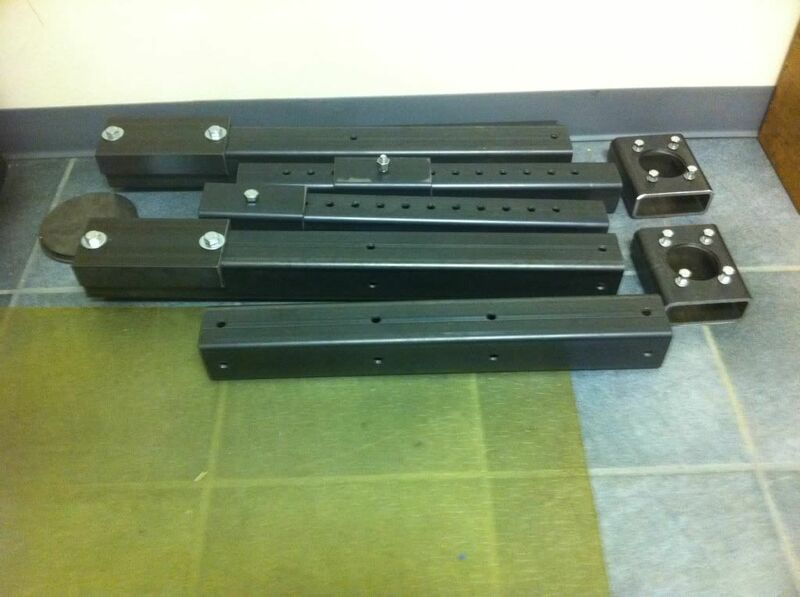 At the front, the rectangular tubing would tie into the front K-frame mounts on the Rampage. At the rear, the rectangular tubing would tie into the rear unibody "rails" at the location of the rear leaf springs. The short horns would tie into the main rails and to the rocker channels. 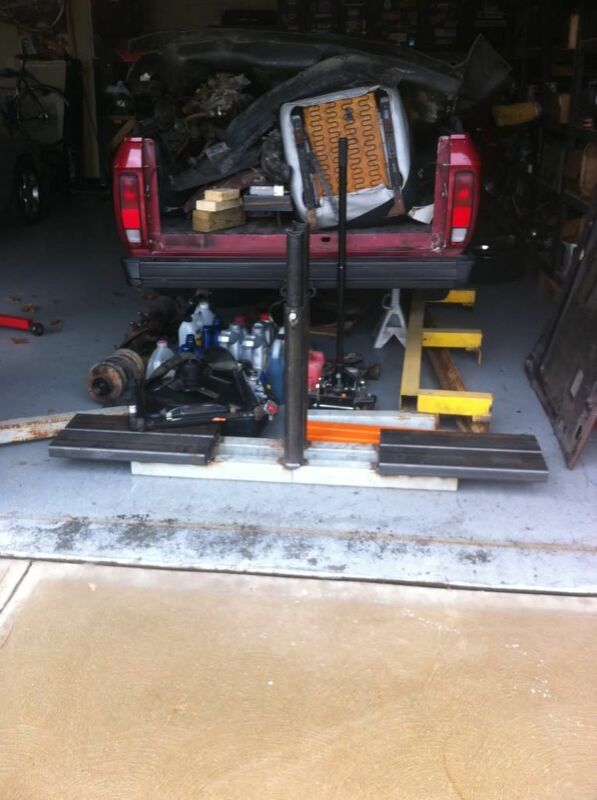 There would be additional cross-pieces between the two frame rails, as shown. I think there will have to be some tri-angulation and gussets involved as well. Please let me know if this looks like a reasonable plan. 1 more pic, this time of more rotisserie parts. The 3" tubing with the "saddles" bolted on will be attached to the ends of the rotisserie. The saddles will be welded to the underside of the ends, and the 3" tubes will bolt to the saddles. This will allow it to break down into a smaller package after the rotisserie is done being used. The 2-1/2" tubes with all the holes will provide the vertical adjustment for the mounting points to the body (to get the center of gravity right for rotational purposes). The 5" tubing with the holes and bolts will be fitted to some Neon stub axles, which will allow the entire body to rotate. 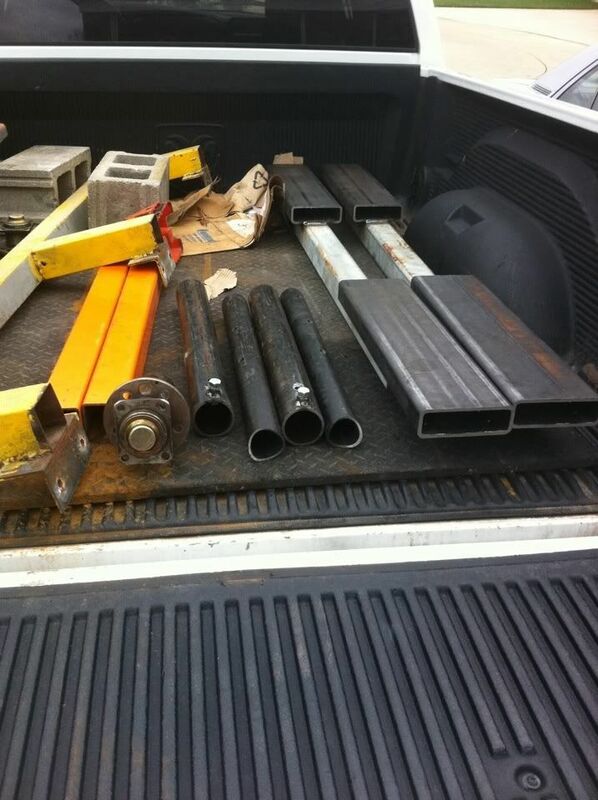 The shorter piece of 3" tubing in the foreground will tie together the 2 long pieces of 2-1/2" tubing that will join the 2 ends, underneath the truck's body. I realize that these may not be the most interesting photos, but this is where I'm at in the build. For years I didn't lower the Merk much and made lots of passes of 200 +-5 MPH, but couldn't put 2 together till 98. In 1999 and 2000 lowered the car a bunch and went fairly fast with a N/A motor. I just thought too much like an OEM engineer. Not a RACER. I don't make that mistake these days. Rick - thanks for the input. I think you are right, I should get it as low as possible. I have been studying the suspension with an eye towards getting lower. Once on the salt, I don't think there is much need for ground clearance, correct? Any idea how much ground clearance you were running with your Merk? The tires shown in the photo are about 1/2" bigger than I intend to run at race time, but 1/4" on the radius isn't much in terms of lowering. The other current limiting factor is that the factory strut is just about bottomed out in that photo. The 1st generation Neon struts are about 2" shorter, which would allow a deeper drop. The other thing that happens is that the lower control arms start to get a funny geometry with an extreme drop. Something I'm looking at changing is the relative elevation of the front K-frame, where the lower CA's mount. I think I might be able to raise the K-frame up about an inch, which would help to improve the geometry to some extent. I also plan to flip the tie-rod ends to the underside of the steering arm for better geometry (using heim joints), and to keep the tie rods from hitting the subframe rail. I can always come up with some camber adjustment plates for the upper strut mounts. I'm actually day-dreaming about running an air suspension system (air bags which fit over the struts) to fine-tune the ride height, and also allow the truck to go over a curb or up onto the trailer as needed by airing up the bags. I think that's do-able, but is not exactly in keeping with the K.I.S.S. parameters. Great start and project! Good to see you have plenty of shop back up, it is amazing what the shop guys can make for you if you get them involved with your project. Also like your commitment to doing all of the car your self, what great experience and learning potential. You will be surprised what you can do and how much you will learn. Listen to the guys on this site, a lot of really great experience here. Looking forward to the progress reports.